With more than 80 retail stores throughout Africa and South Africa, CTM needed a solution for managing assets, production time and distribution with ease. 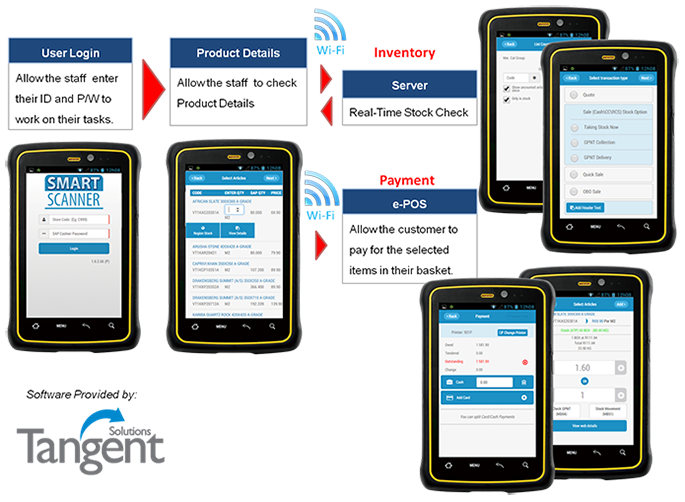 The WinmateE430M2-3BM rugged handheld device not only fulfilled these needs, it alsoenabled them to optimize the supply chain and reduce costs. The E430M2-3BM was designed toautomate store and warehouse efficiencies enabling users to increase product handling, reduce costs associated with handling delays or missing inventory, and streamline the supply chain. With a built-in Motorola barcode scanner, the rugged handheld device allows users to track incoming and outgoing products, while storing and monitoring warehouse inventory information in real time. This allows warehouse staff to check a shipment’s location status and locate inventory records instantaneously. CTM also utilized the E430M2-3BMfor its robust, user-friendly payment system capabilities to streamlinethe checkout experience andeliminate the need to exchange cash. The Winmate E430M2-3BM integrates the best-in-the-industry e-commerce software, developed by Tangent Solutions, a leader inhighly specialized mobile solutions for enterprise. This Software application from Tangent Solutions was implemented by CTM, the country’s largest bathroom retail chain within 80 stores in Africa. Our Winmate E430M2-3BM allows CTM to manage assets, production time and distribution with ease, optimizing the supply chain and reducing costs. 1. What type of data will we need to collect? 2. Do we need to track assets and how (barcode, RFID, NFC)? 3. Will the devise be used indoors, outdoors or both? 4. Will a continuous battery be necessary? 5. What wireless communications features will we need? GPS, Bluetooth? Once you've answered these, it's a matter of deciding on form factor, operating system, and taking into account the environment in which the handheld will be used. E430M2, Winmate's lightweight, yet durable handheld device features a sunlight-readable 4.3-inch multi-touch screen, powerful Android computing and multiple ports for expansion. The E430M2-3BM also offers robust data collection with Motorola barcode scanners and dual cameras. Advanced communications options such as WLAN, GPS, Bluetooth and optional 3G enable uninterrupted communications and connectivity. The handheld’s rugged construction also protects it from shock, dust, liquid, vibration and extreme temperatures. Winmate’s E430M2-3BM offers an enterprise-ready solution for streamlining efficiencies in store and warehouse operations.